Explain the terms in Bernoulli’s equation. Explain how Bernoulli’s equation is related to conservation of energy. Explain how to derive Bernoulli’s principle from Bernoulli’s equation. List some applications of Bernoulli’s principle. There is a pressure difference when the channel narrows. This pressure difference results in a net force on the fluid: recall that pressure times area equals force. The net work done increases the fluid’s kinetic energy. As a result, the pressure will drop in a rapidly-moving fluid, whether or not the fluid is confined to a tube. There are a number of common examples of pressure dropping in rapidly-moving fluids. Shower curtains have a disagreeable habit of bulging into the shower stall when the shower is on. The high-velocity stream of water and air creates a region of lower pressure inside the shower, and standard atmospheric pressure on the other side. The pressure difference results in a net force inward pushing the curtain in. You may also have noticed that when passing a truck on the highway, your car tends to veer toward it. The reason is the same—the high velocity of the air between the car and the truck creates a region of lower pressure, and the vehicles are pushed together by greater pressure on the outside. (See Figure 1.) This effect was observed as far back as the mid-1800s, when it was found that trains passing in opposite directions tipped precariously toward one another. Figure 1. An overhead view of a car passing a truck on a highway. 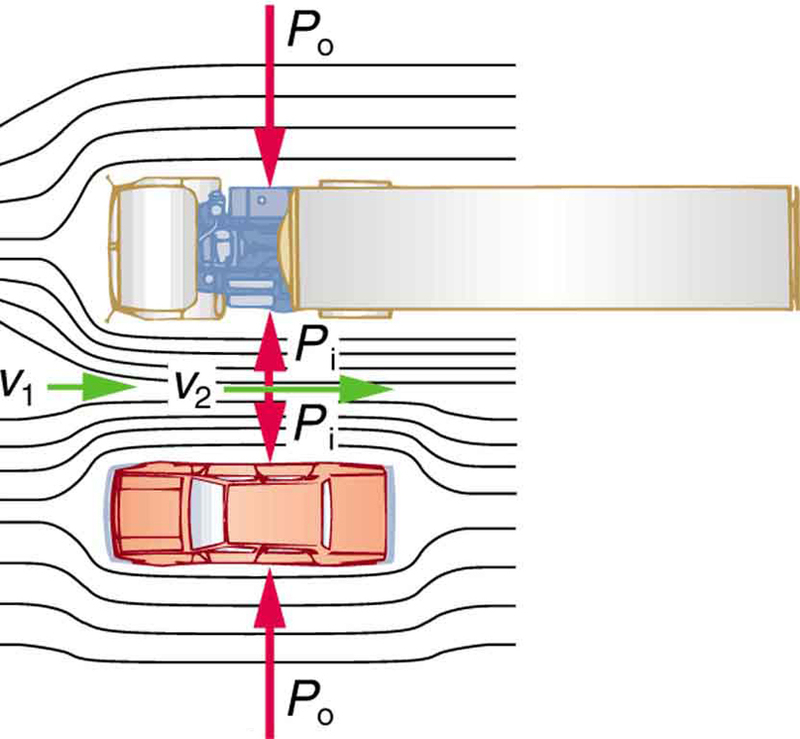 Air passing between the vehicles flows in a narrower channel and must increase its speed (v2 is greater than v1), causing the pressure between them to drop (Pi is less than Po). Greater pressure on the outside pushes the car and truck together. Hold the short edge of a sheet of paper parallel to your mouth with one hand on each side of your mouth. The page should slant downward over your hands. Blow over the top of the page. Describe what happens and explain the reason for this behavior. so is the gravitational potential energy per unit volume. Note that pressure has units of energy per unit volume, too. Since its units are If we multiply these by m/m, we obtain or energy per unit volume. Bernoulli’s equation is, in fact, just a convenient statement of conservation of energy for an incompressible fluid in the absence of friction. Conservation of energy applied to fluid flow produces Bernoulli’s equation. The net work done by the fluid’s pressure results in changes in the fluid’s and per unit volume. If other forms of energy are involved in fluid flow, Bernoulli’s equation can be modified to take these forms into account. Such forms of energy include thermal energy dissipated because of fluid viscosity. The general form of Bernoulli’s equation has three terms in it, and it is broadly applicable. To understand it better, we will look at a number of specific situations that simplify and illustrate its use and meaning. This equation tells us that, in static fluids, pressure increases with depth. As we go from point 1 to point 2 in the fluid, the depth increases by and consequently, is greater than by an amount In the very simplest case, is zero at the top of the fluid, and we get the familiar relationship (Recall that and ) Bernoulli’s equation includes the fact that the pressure due to the weight of a fluid is Although we introduce Bernoulli’s equation for fluid flow, it includes much of what we studied for static fluids in the preceding chapter. Situations in which fluid flows at a constant depth are so important that this equation is often called Bernoulli’s principle. It is Bernoulli’s equation for fluids at constant depth. (Note again that this applies to a small volume of fluid as we follow it along its path.) As we have just discussed, pressure drops as speed increases in a moving fluid. We can see this from Bernoulli’s principle. For example, if is greater than in the equation, then must be less than for the equality to hold. In Chapter 12.1 Example 2, we found that the speed of water in a hose increased from 1.96 m/s to 25.5 m/s going from the hose to the nozzle. Calculate the pressure in the hose, given that the absolute pressure in the nozzle is (atmospheric, as it must be) and assuming level, frictionless flow. This absolute pressure in the hose is greater than in the nozzle, as expected since vv is greater in the nozzle. The pressure in the nozzle must be atmospheric since it emerges into the atmosphere without other changes in conditions. There are a number of devices and situations in which fluid flows at a constant height and, thus, can be analyzed with Bernoulli’s principle. People have long put the Bernoulli principle to work by using reduced pressure in high-velocity fluids to move things about. With a higher pressure on the outside, the high-velocity fluid forces other fluids into the stream. This process is called entrainment. Entrainment devices have been in use since ancient times, particularly as pumps to raise water small heights, as in draining swamps, fields, or other low-lying areas. Some other devices that use the concept of entrainment are shown in Figure 2. Figure 2. Examples of entrainment devices that use increased fluid speed to create low pressures, which then entrain one fluid into another. (a) A Bunsen burner uses an adjustable gas nozzle, entraining air for proper combustion. (b) An atomizer uses a squeeze bulb to create a jet of air that entrains drops of perfume. Paint sprayers and carburetors use very similar techniques to move their respective liquids. (c) A common aspirator uses a high-speed stream of water to create a region of lower pressure. Aspirators may be used as suction pumps in dental and surgical situations or for draining a flooded basement or producing a reduced pressure in a vessel. (d) The chimney of a water heater is designed to entrain air into the pipe leading through the ceiling. The airplane wing is a beautiful example of Bernoulli’s principle in action. Figure 3(a) shows the characteristic shape of a wing. The wing is tilted upward at a small angle and the upper surface is longer, causing air to flow faster over it. The pressure on top of the wing is therefore reduced, creating a net upward force or lift. (Wings can also gain lift by pushing air downward, utilizing the conservation of momentum principle. The deflected air molecules result in an upward force on the wing — Newton’s third law.) Sails also have the characteristic shape of a wing. (See Figure 3(b).) The pressure on the front side of the sail, is lower than the pressure on the back of the sail, This results in a forward force and even allows you to sail into the wind. For a good illustration of Bernoulli’s principle, make two strips of paper, each about 15 cm long and 4 cm wide. Hold the small end of one strip up to your lips and let it drape over your finger. Blow across the paper. What happens? Now hold two strips of paper up to your lips, separated by your fingers. Blow between the strips. What happens? Figure 3. (a) The Bernoulli principle helps explain lift generated by a wing. 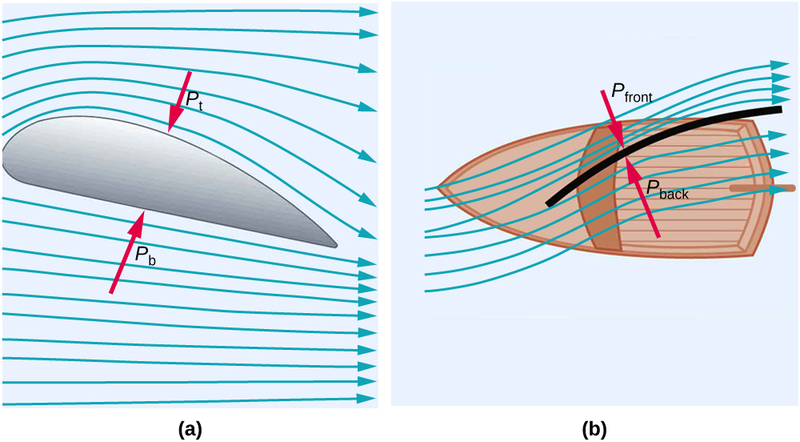 (b) Sails use the same technique to generate part of their thrust. Figure 4(b) shows a version of this device that is in common use for measuring various fluid velocities; such devices are frequently used as air speed indicators in aircraft. Figure 4. Measurement of fluid speed based on Bernoulli’s principle. (a) A manometer is connected to two tubes that are close together and small enough not to disturb the flow. Tube 1 is open at the end facing the flow. A dead spot having zero speed is created there. Tube 2 has an opening on the side, and so the fluid has a speed v across the opening; thus, pressure there drops. The difference in pressure at the manometer is (1/2)ρv22, and so h is proportional to (1/2)ρv22. (b) This type of velocity measuring device is a Prandtl tube, also known as a pitot tube. Bernoulli’s principle has many applications, including entrainment, wings and sails, and velocity measurement. 1: You can squirt water a considerably greater distance by placing your thumb over the end of a garden hose and then releasing, than by leaving it completely uncovered. Explain how this works. 2: Water is shot nearly vertically upward in a decorative fountain and the stream is observed to broaden as it rises. Conversely, a stream of water falling straight down from a faucet narrows. Explain why, and discuss whether surface tension enhances or reduces the effect in each case. 4: Give an example of entrainment not mentioned in the text. 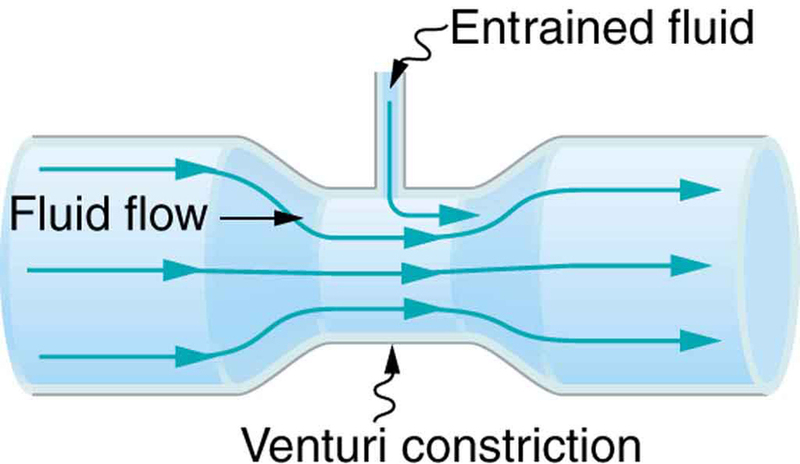 5: Many entrainment devices have a constriction, called a Venturi, such as shown in Figure 5. How does this bolster entrainment? Figure 5. A tube with a narrow segment designed to enhance entrainment is called a Venturi. These are very commonly used in carburetors and aspirators. 6: Some chimney pipes have a T-shape, with a crosspiece on top that helps draw up gases whenever there is even a slight breeze. Explain how this works in terms of Bernoulli’s principle. 7: Is there a limit to the height to which an entrainment device can raise a fluid? Explain your answer. 8: Why is it preferable for airplanes to take off into the wind rather than with the wind? 9: Roofs are sometimes pushed off vertically during a tropical cyclone, and buildings sometimes explode outward when hit by a tornado. Use Bernoulli’s principle to explain these phenomena. 10: Why does a sailboat need a keel? 11: It is dangerous to stand close to railroad tracks when a rapidly moving commuter train passes. Explain why atmospheric pressure would push you toward the moving train. 12: Water pressure inside a hose nozzle can be less than atmospheric pressure due to the Bernoulli effect. Explain in terms of energy how the water can emerge from the nozzle against the opposing atmospheric pressure. 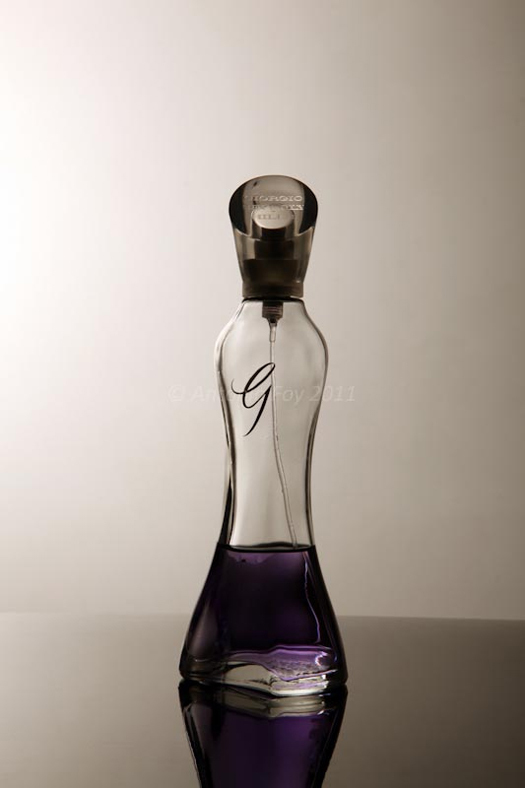 13: A perfume bottle or atomizer sprays a fluid that is in the bottle. (Figure 6.) How does the fluid rise up in the vertical tube in the bottle? 14: If you lower the window on a car while moving, an empty plastic bag can sometimes fly out the window. Why does this happen? 1: Verify that pressure has units of energy per unit volume. 2: Suppose you have a wind speed gauge like the pitot tube shown in [link](b). By what factor must wind speed increase to double the value of in the manometer? Is this independent of the moving fluid and the fluid in the manometer? 3: If the pressure reading of your pitot tube is 15.0 mm Hg at a speed of 200 km/h, what will it be at 700 km/h at the same altitude? 4: Calculate the maximum height to which water could be squirted with the hose in [link] example if it: (a) Emerges from the nozzle. (b) Emerges with the nozzle removed, assuming the same flow rate. 6: (a) Calculate the approximate force on a square meter of sail, given the horizontal velocity of the wind is 6.00 m/s parallel to its front surface and 3.50 m/s along its back surface. Take the density of air to be (The calculation, based on Bernoulli’s principle, is approximate due to the effects of turbulence.) (b) Discuss whether this force is great enough to be effective for propelling a sailboat. where is the height of the manometer fluid, is the density of the manometer fluid, is the density of the moving fluid, and is the acceleration due to gravity. (Note that is indeed proportional to the square root of as stated in the text.) (b) Calculate for moving air if a mercury manometer’s is 0.200 m.
12.2 Bernoulli’s Equation by OpenStax is licensed under a Creative Commons Attribution 4.0 International License, except where otherwise noted.